If you have followed the Entropy Blog the last few months, you have probably seen our excited launch announcements of the various Oxford Global Language sites running on Entropy's Remarkable CMS platform. 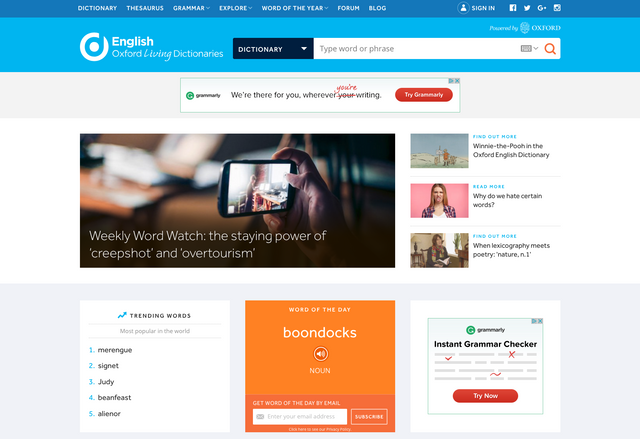 The Oxford Global Languages initiative has now taken a huge turn back toward its roots this week, with the full launch of Oxford Dictionaries Online (in English and Spanish) powered by Remarkable and fully hosted and managed by Entropy. Not only will visitors to Oxford Dictionaries enjoy a totally new portal to global language content, but in addition to the immense and rich content available to English and Spanish readers, the Global Languages initiative now includes even more content - including Latvian & Romanian languages - adding to our previous launches of Malay, Urdu, Indonesian, Setswana, Northern Sotho, and Zulu. With the Global Oxford Dictionaries portal now running on Remarkable's latest 'Enigma' release, and the extensive integration with Oxford lexical content and backend servcies across all global language sites, today's launch of English and Spanish content represents a significant milestone for both Entropy and our Remarkable platform. We are absolutely thrilled to have worked with an incredible team at Oxford University Press to make this amazing achievement possible. And it won't stop there - as we have more languages to come in just a few weeks! Now come on over and experience the all new Oxford Dictionaries Online powered by Entropy and Remarkable!